2014 Aaron Donald National Treasures Auto RC #/99 DPOY! All cards are in nm-mint condition. 2014 Aaron Donald Upper Deck Star Football Rookie Card RC #129 (1st Graded, Gem Mint 10). 2014 Topps Platinum Aaron Donald RC Rookie Patch Auto Autographed L.A. Rams MVP. Condition is Like New. Shipped with USPS First Class Package. 2014 National Treasures Aaron Donald Autograph Rookie Card. (A. Donald's Best Base Rookie Card). Serial No. 87/99. LOT, THEN IT IS FOR ONE CARD. OTHERWISE, IT IS FOR ONE CARD AND EACH PICTURE (IF THERE IS MORE THAN ONE PICTURE) AND SERIAL NUMBER REPRESENTS ONE OF EACH OF THE CARDS FOR. 2014 Topps Chrome Aaron Donald Xfractor Rookie RC #175 Los Angeles Rams. Condition is Like New. Shipped with USPS First Class Package. You get all 4 cards. 2014 Leaf Draft Gold #2 Aaron Donald RC (X2). Lot of two football cards. I WILL RESPOND WITH AN ANSWER ASAP. 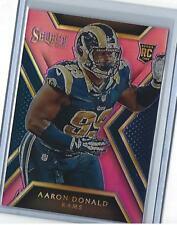 2014 Rookies & Stars AARON DONALD Rookie Card RC RAMS FREE SHIPPING!!!!! 2014 FINEST AARON DONALD ROOKIE REFRACTOR 2 CARD LOT REFRACTOR & XFRACTOR. Shipped with USPS First Class Package. AARON DONALD 2014 Topps Chrome ROOKIE Orange SP Refractor LOS ANGELES RAMS Hot! AARON DONALD 2014 Topps ROOKIE Gold Border SP 662/2014 LOS ANGELES RAMS Hot!!! Card # 332. Card Condition - NM-MT. You’re purchasingan Aaron Donald 2014 RC lot. The football cards shown in the images are theexact cards you will receive. Details ontheAaron Donald cards can be found below and within the images 2014 Prestige RC #202 . 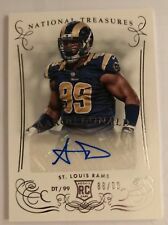 2014 Panini Prizm RC #228 ~ Aaron Donald ~~ Rams ~. You’re purchasingan Aaron Donald 2014 Panini Prizm RC. The football card shown in the images is theexact card you will receive. Details ontheAaron Donald card can be found above and within the images. T he more you buy the more you can save. Aaron Donald Topps Chrome Gold 2014 Rookie RC DPOY GOAT Mini 05/10. You're viewing a 2014 Topps Chrome Aaron Donald RC X-fractor card in NM/M condition or better!